“When you’re retrieving something out of a computer’s memory, you don’t change anything — it’s simple playback,” said Robert Bjork, a psychologist at the University of California, Los Angeles, who was not involved with the study. 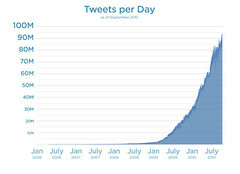 Twitter has reached nearly 200 million registered accounts who post 110 million tweets per day as of the January 1, 2011, Twitter spokesperson Carolyn Penner tells me. That’s up from 160 million registered accounts as of September 2010 and 95 million tweets per day as of early December— steady, but not explosive, growth. That’s why the company is now focused on building out its international presence.